The ska/reggae group were originally called The Ramong Sound (or The Ramongs), and had two lead singers, Clem Curtis and Raymond Morrison (aka Ramong Morrison). In 1967, they became The Foundations and practiced and played in a basement club called the Butterfly Club in London. The group were made up of West Indians, White British, and a Sri Lankan. The line-up included Tim Harris (drums 1948-2007), Alan Warner (vocals and guitarist), Peter Macbeth (bass), Tony Gomez (keyboards 1938-2015), and Clem Curtis (lead vocals). The group had flirted with two lead singers and Arthur Brown (The Godfather Of Hellfire) and Rod Stewart had at one time matched with Clem Curtis but these unions lasted only a short time. The West Indian horn section, consisted of Jamaican-born Mike Elliott (tenor sax) and Pat Burke (flute, tenor sax), both saxophonists and Dominican-born Eric Allandale (1936-2001) on trombone. They were all highly experienced musicians who came from professional jazz and rock-and-roll backgrounds. Tony Macaulay came to see them play but had a bad hangover and initially did not rate them. On second thoughts he blamed the headache and gave them the benefit of the doubt. They signed for the Pye label and released 'Baby Now That I've Found You, ' written by Tony Macaulay with John MacLeod and it went nowhere. At the same time the BBC was keen to feature new records not favoured by the pirate radio stations. "Baby, Now That I've Found You" took off from being a sleeper and i 1967 was number one in the UK Singles Chart. 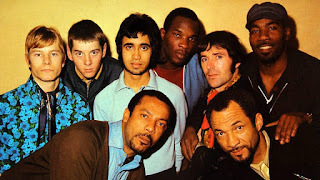 The group was the first multi-racial group to have a number 1 hit in the UK in the 1960s and drew much interest and intrigue due to its size and structure. Under the management of Barry Class and Fairway they continued to honour their previous bookings despite their chart success. Their second single was "Back On My Feet Again" (1968), and sold less well but did made it to #18 in the UK, and #29 in Canada. Relationships between the band and Tony Macaulay became strained after he would not allow them to record any of their own songs. "Any Old Time (You're Lonely And Sad), " the follow up single barely broke into the Top Fifty (UK #48). With growing tensions within the group Clem Curtis and Mike Elliott left the band. Clem Curtis moved to the US for a solo career on the club circuit and was replaced in The Foundations by Colin Young. Now with Colin Young as lead singer, the band released "Build Me Up Buttercup" co-written by Macaulay with Mike d'Abo (Manfred Mann) topped the charts internationally. Mike d'Abo played the introduction on 'Build Me Up Buttercup'. A year later, "In the Bad Bad Old Days (Before You Loved Me)" became another hit. Peter Macbeth left the band and was replaced by Steve Bingham. Behind the scenes a feud broke out between their managers and Fairway made an acrimonies departure. The group decided to breakaway but a tour to support The Temptations at the newly opened Copacabana club ended in disaster and the band returned to the UK. On their return to the UK Mike Dolan took over the group's affairs and they had modest success with "Born to Live, Born to Die" which was written by Eric Allandale and Tony Gomez. The final chart entry from the group came in 1969 with "My Little Chickadee", which barely made the US Hot 100. The more commercial "Take A Girl Like You", (1970) was the title song to the Oliver Reed and Hayley Mills film, but failed to attract commercial attention . After "I'm Gonna Be A Rich Man," a more meatier bluesy rocker failed, the band split in late 1970. One of the last record releases was "Stoney Ground" in 1971. This has subsequently become a classic Northern Soul favourite. Unlike Hot Chocolate, the group failed to keep abreast of popular Disco music and whilst their roots were in ska and reggie, the band broke up before the resurgence in Blue beat and Two tone music. There were several attempts to resurrect The Foundations but with little success despite of releasing several singles. Clem Curtis' re-formed Foundations was perhaps the best known but a short lived collaborative between trombonist Eric Allandale and drummer Tim Harris met with little success. Colin Young fronted a group called the Foundations which led to a court case and now only Clem Curtis is allowed to bill his group as either the Foundations or Clem Curtis & the Foundations. Young appears as "The New Foundations", or as "Colin Young & the New Foundations". In 1999, after "Build Me Up Buttercup" appeared on the soundtrack of the film, There's Something About Mary, and new version of the Foundations appeared with Colin Young (vocals), Alan Warner (Guitar), Steve Bingham (bass), Gary Moberly (keyboards), Tony Laidlaw (sax) and Sam Kelly then Steve Dixon (drums). Sometime later Young left the group and was replaced by Hue Montgomery (aka Hugh Montgomery).